The Cubs addressed abuse allegations detailed in a blog post by Addison Russell's ex wife. The shortstop has since been placed on administrative leave. NOTE: NBC Chicago will offer a live feed as Cubs manager Joe Maddon speaks to the media Friday afternoon. Watch live above and read more on the Cubs' reaction here. For the first time since their divorce, the ex-wife of Chicago Cubs shortstop Addison Russell is speaking out about what she described as emotional and physical abuse she says she suffered at the hands of her then-husband. In a lengthy blog post published this week, Melisa Reidy-Russell detailed allegations of physical mistreatment and "emotional and verbal abuse." "The first time I was physically mistreated by my spouse, I was in shock," Reidy-Russell wrote. "I couldn’t wrap my head around what just happened…Why did he get so angry? What did I do for him to want to put his hands on me? Of course I forgave him & assumed it would never happen again." WARNING: The video contains content that is disturbing. An August 2016 surveillance video of minor league baseball player Danry Vasquez beating his then-girlfriend Fabiana Pérez in the stairwell of a Corpus Christi, Texas, stadium went viral in March 2018. The incident, caught on a surveillance camera, generated outrage and led to Vasquez’s ouster from Lancaster Barnstormers of the independent Atlantic League of Professional Baseball, who signed Vasquez even though his arrest for the beating had been public knowledge. In wake of the post, Major League Baseball placed Russell on administrative leave Friday, saying it "takes all allegations of Domestic Violence seriously." The Cubs said the team supports that decision. The post, titled "You no longer have a secret, you have a story," marks the second time such allegations have surfaced against the Cubs star. Just before the couple filed for divorce, Reidy-Russell published a highly-publicized Instagram post accusing her husband of infidelity. Though the post was eventually deleted, a comment from one of her friends alluded to domestic violence allegations. At the time, Russell denied the accusations. “Any allegation I have abused my wife is false and hurtful,” Russell said after the first Instagram post was published. MLB launched an investigation into the claims in June 2017, but said Reidy-Russell declined to cooperate "at that time." The investigation has remained open since, according to the league. "We are hopeful that this new information will allow us to complete the investigation as promptly as possible," the league wrote in a statement Friday. 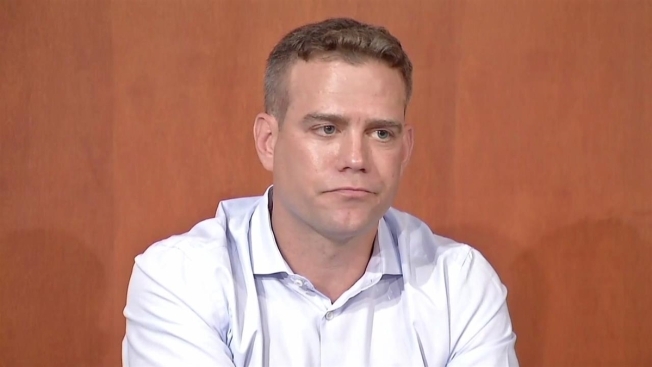 Russell has not publicly commented on the latest allegations, but Cubs President Theo Epstein said he saw the post late Thursday and "immediately reached out to the league's investigative body." He called the post "disturbing" and said he and Cubs owner Tom Ricketts met with Russell Friday morning to tell him he would be placed on administrative leave. "Timing or inconvenience doesn't play into it," Epstein said. "What matters is getting to a just and fair resolution." According to Reidy-Russell, the Cubs star cheated on her "with so many different women" and emotional and verbal abuse was "an everyday thing." "Being blamed for just about anything that went wrong, name calling, intimidating me with personal force, manipulating me to think I was the problem, destroying my personal things, threatening me to 'send' me & our son home to my parents as if I was privileged to be living in our home," she wrote. "Basically, I felt like I was nothing, a nobody & I was nothing without him, & I couldn’t do anything without him." Reidy-Russell wrote the abuse grew worse over time and "grew to new levels." "Friends would express their concerns with me but I would assure them that I was okay, he lost his temper & wasn’t himself," she wrote. "Everyday began to be a struggle to fake the convincing smile of a happy wife I grew accustomed to." Reidy-Russell wrote she decided to leave after Russell "betrayed" her again in April 2017. "About a month after leaving, I returned for a visit so my son could see his father, also in hopes that maybe, just maybe I’d see a change in my husband," the post read. "But, as I expected our visit was a nightmare, I swore to myself it would be the last time he’d lay his hands on me & it would be that last time I’d let my son be a witness to it. A week after flying home, I finally made the call and took legal action to start our separation." Reidy-Russell's attorney announced in June 2017 that she had filed for divorce, noting that it was "her desire to pursue a resolution that is, first and foremost, in the best interest of the parties' son, and which occurs in a swift, amicable, and private fashion." The Tribune reports the couple's marriage was officially dissolved in a Florida court Aug. 30. "If you are reading this and you can relate, please know & never forget how loved you are," Reidy-Russell wrote. If you or someone you know is in need of assistance, the National Domestic Violence Hotline is 1-800-799-SAFE (7233) and more resources can be found at thehotline.org.